Wylie Crawford taught himself to play the carillon in the University’s own Rockefeller Chapel almost 50 years ago. Today he has been the University carillonneur for 31 years and is the president of the World Carillon Federation. As a firm believer in the magic of the bells, he has been instrumental in the history of the University and of Chicago’s carillon community, making a point of continuing the legacy and sharing the wealth. He not only has unique access to the carillon’s history; he has become a part of it. The Rockefeller carillon is played twice each weekday and on Sunday afternoons. But when the music reaches so far, it’s easy to take it for granted. Campus’ seemingly anonymous serenades come from the second-largest instrument in the world, composed of an impressive 72 bells that range from 10 pounds to 17 tons and are housed in Rockefeller Chapel's tower. The carillon is played from a mechanical keyboard using both hands and feet. Many may not realize just how much the carillon is laced into the life of the average student even beyond the typical performances, but Crawford is uniquely aware of it. It has been his duty as head carillonneur to play the opening and closing convocations for many years. For Crawford, a lifelong journey with the carillon began in the ’60s when he was working on his Masters of Arts in Teaching at the University. One evening, drawn by the music, he stumbled upon an annual gala performance he described as “creative insanity.” The spectacle included a traveling carillon in addition to Rockefeller’s bells, a row of tubas along the roof of the Chapel, and spotlights. When “Stars and Stripes Forever” was played, Chicago journalist Studs Terkel played the cymbals and the University’s president played the bass drum. The following Sunday he took the tour of the carillon tower where he found the third University carillonneur and orchestrator of the dramatic performance, Daniel Robins. But when Crawford asked if he could take lessons, Robins drew himself up and said, “I don’t give lessons.” But, persistent, Crawford didn’t give up. He asked how he could practice, and Robins eventually relented, offering him a key to a room in the basement where there was a practice keyboard. There is a notable difference between playing on a practice keyboard, particularly the un-weighted one the Chapel had then, and playing high up in the tower where players have to contend with the weight of the bells and the effort it takes to push the keys or even how the keys bounce back. The first time Crawford actually climbed the steps to play, though, was because Robins called him at three in the morning and said that he wasn’t going to make it to play the next morning after the service. But luckily it wasn’t the last. 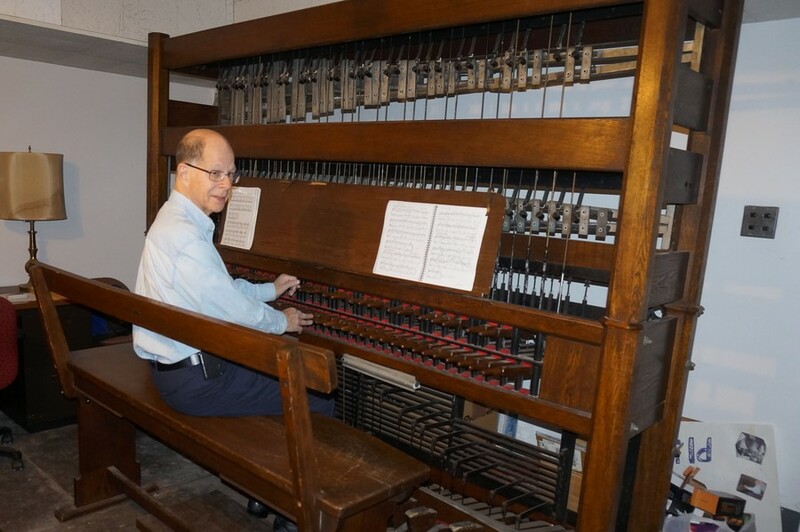 In 1974 he became the assistant university carillonneur and 10 years later he stepped up to the full position. He’s calculated that by now, he has climbed one million steps in Rockefeller alone. When he became the head carillonneur, he founded a guild of student carillonneurs affectionately called the “Rockebellers” that eventually became a Recognized Student Organization. Unlike the reaction he found when he wanted to learn, Crawford has gone out of his way to give students the opportunity to play the carillon. He credits his very first students to an ad placed in The Maroon. Now each year the program hears auditions on another instrument and takes eight to 10 students in the fall. Students begin with basic movements and notations in the first quarter, build their repertoire in the second, and study the history of the carillon, its music, and its community in the third quarter. Crawford, not just a symbol for UChicago carillon, also founded several other teaching programs in new and old carillons around the Chicago area and even in the western suburb Naperville after helping design their recently installed carillon. Five of his students from Naperville have gone on to become certified carillonneurs like himself. He has also had one of his students from the University of Chicago do the same. Today at 72 years old, Crawford still climbs the 271 steps to the tower at least twice a week to perform. He’s particularly proud of a few celebrity moments–playing for Christie Hephner’s wedding and for Bill Clinton–and of helping to push a universal standard for carillon keyboards that has been in place for almost a decade.